The Cypress Moon Inn in Kitty Hawk overlooks the Albemarle Sound and in the distance, to the southwest, Alligator River National Wildlife Refuge, among the stomping grounds for the endangered red wolf. An Outer Banks resident for 43 years, Greg Hamby co-owns the inn with his wife, Linda. 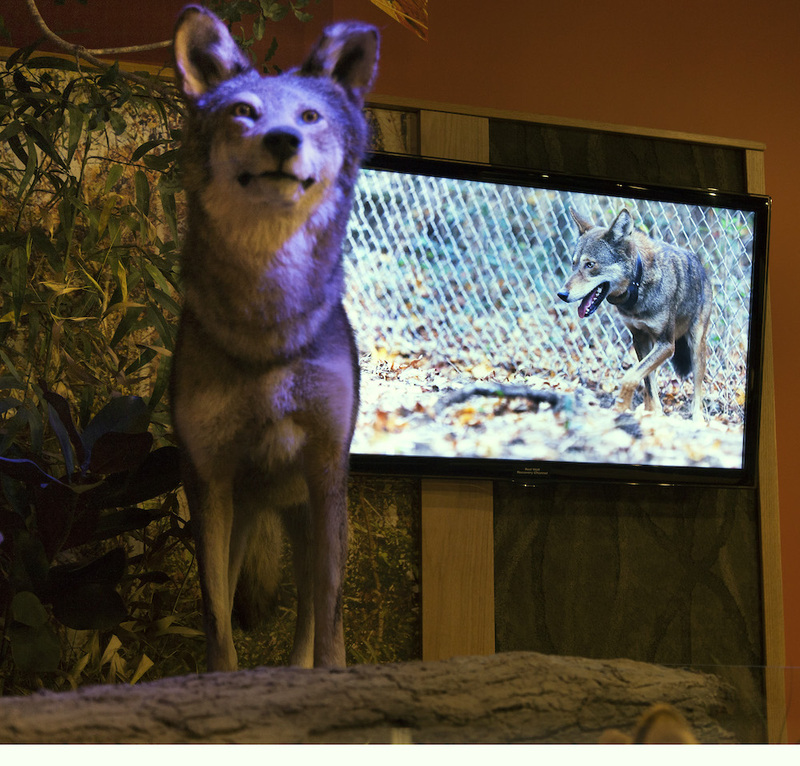 He welcomes the red wolves, which roam over their native land in six counties in eastern North Carolina, as his neighbors. The US Fish & Wildlife Service hosted the meeting, one of two gatherings on the coast last week. The agency is crafting a revised recovery plan for red wolf, a process that has been complicated by opposition from some landowners, court cases to stop those landowners from killing the wolves, support from scientists, and conflicting messages from federal officials themselves. “We hope to make conditions better for both residents and the red wolves,” said Joe Madison, USFWS project leader of the Red Wolf Recovery Program. Part of the wolves’ original habitat, Eastern North Carolina is the only place in the world where red wolves live in the wild. 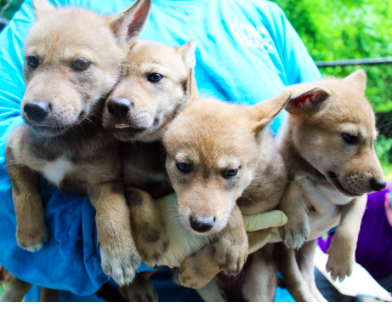 (Six pups were born on April 29 at the Museum of Life & Science in Durham; four have survived.) And their numbers are diminishing. Estimates range from 29 to 40 wolves are still alive, down from 150 in the early 2000s. Some have been hit by cars; others have been shot. Others have interbred with coyotes, which dilutes the genetic bloodline. To assuage landowners who don’t want wolves treading on their land, USFWS has considered trying to move all of the wolves on federal lands in Dare County. However, wolves being wolves, don’t recognize political boundaries. The agency also has weighed removing all of the wolves from the wild and relocating them to zoos, which house about 200 throughout the US. For wolf proponents (and likely the wolves themselves), this robs the animals of their natural habitat. As of June 13, the US Fish & Wildlife Service has received more than 2,100 comments. The agency is accepting public input through July 24. Go to www.regulations.gov and search for FWS-R4-2017-0006-0001 or this link will take you to the page. USFWS will take the comments to craft a recovery plan. A series of public hearings will be held on that document later this year. A final rule is expected to be released next year, which will also be subject to public comment. Please save the red wolf and allow it to roam in its habitat. Allow them freedom as nature has intended and nature will hopefully protect them. I do hope there is some kind of justice for the wolf if some one shoots just one. There should be a fine and possibly a few days in jail. We need to protect, not destroy. Pls protect and allow the wolves to remain free in the South. Its their ancestral home… They were there before we ( white men) were… Native Indians had no issue coexisting with them. Cattle/livestock dogs; better fencing; or putting stock in barns overnight are all time- proven deterrants. Pls do the RIGHT thing and protect & preserve these fellow children of God. Thank you. ??????????????????????????? ?WOLVES ARE ESSENTIAL FOR A HEALTHY ECOSYSTEM. THEY SHOULD REMAIN FULLY PROTECTED UNDER THE ENDANGRRED SPECIES ACT. STOP MURDERING OUR WILDLIFE!!! ???????????????????????????? One of my most precious North Carolina memories is of coming face-to-face with a red wolf on the shores of Lake Mattamuskeet. Just as the birds bring visitors to southeastern North Carolina, so can the wolves. Please do everything possible to preserve them in their wild state.